During the 19th century, a gently bred young lady with no fortune, no family, and no prospects had few options for making her way in the world. She might hire herself out as a companion, of course. Or if she was particularly adept with a needle, she might take in a bit of sewing. Both were respectable, genteel occupations for a lady down on her luck and, as such, both are well-represented in historical novels. However, despite the undoubted romantic appeal of the penniless companion and the impoverished seamstress, neither position provides the wealth of literary possibilities inherent in the role of governess. Whether the novel is a Gothic, a romance, a mystery, or a comedy of manners, the character of governess is perfectly at home. At her wise, intellectual best, she is a creditable heroine. At her narrow-minded, tyrannical worst, she is a formidable villain. And when combined with the various misdemeanors and mishaps of her young charges, she provides the perfect comic foil. 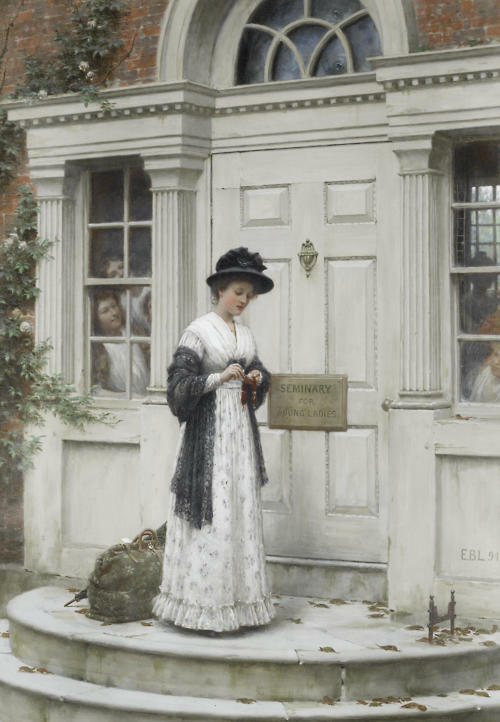 by Edmund Blair Leighton, (1853-1922). 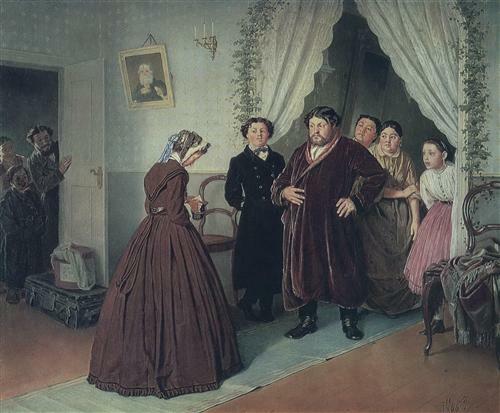 Arrival of a New Governess in a Merchant’s House by Vasily Perov, 1866. 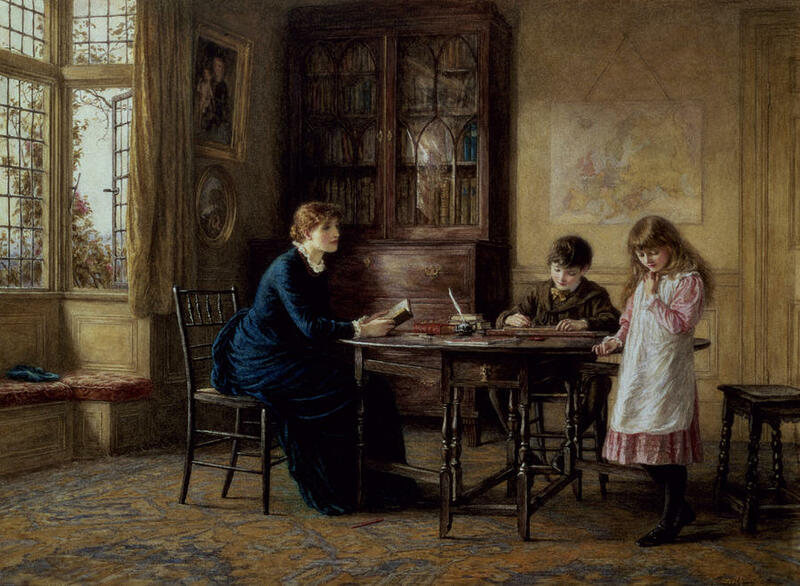 Employing a Governess by Emily Shanks, (1857-1936). One can only imagine what sort of deplorable steps our poor young governess has taken. Has she succumbed to the advances of one of the young gentlemen in the household? Not that it particularly matters. As Ridout explains in a roundabout way, whether the masculine attentions are welcome or unwelcome, if a governess is compromised by a gentleman of the family, it is her own fault. 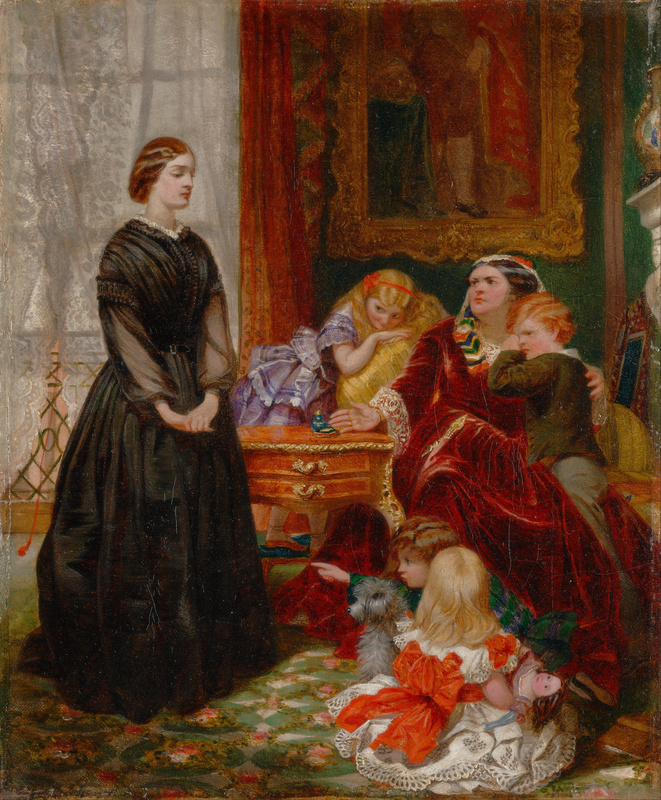 The Governess by Emily Mary Osborn, 1860. Charlotte Brontë’s Jane Eyre (1847)features one of the most famous depictions of a governess in all of English literature. Proving that even a young woman with no beauty, no money, and no connections can be the heroine of her own story, Jane leaves the oppressive Lowood School to take a position as governess at Thornfield Hall. There, she meets the mysterious Mr. Rochester and experiences firsthand the particular miseries of a governess who falls in love with her employer. In the following scene, Jane is forced to sit in the drawing room amongst Mr. Rochester’s guests and listen as the beautiful Blanche Ingram and the rest of the assembled company deride her profession. I feared— or should I say, hoped?— the allusion to me would make Mr. Rochester glance my way; and I involuntarily shrank farther into the shade: but he never turned his eyes. 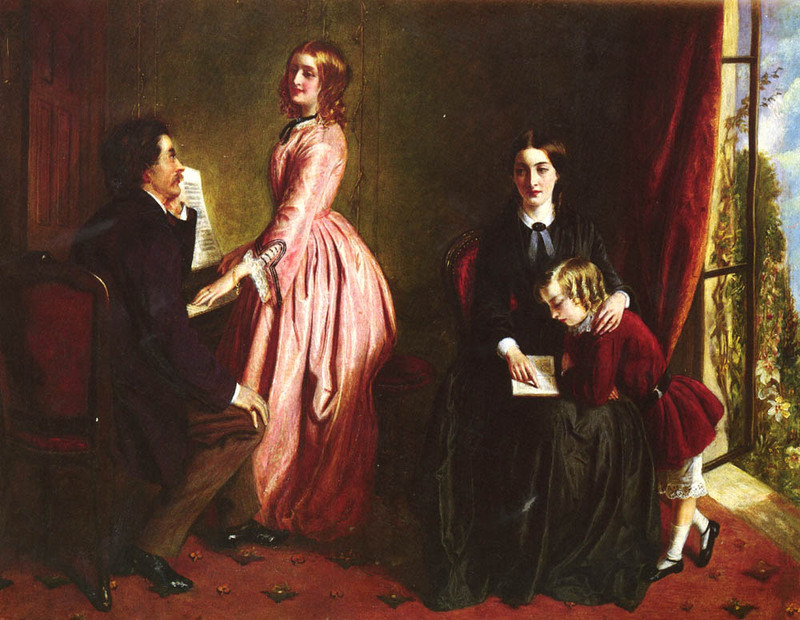 The Governess by Rebecca Solomon, 1851. Not every literary governess is content with fading into the background. In Vanity Fair (1847) by William Makepeace Thackeray, Becky Sharp aspires to better things and is not opposed to a bit of treachery in order to get them. Employed as a governess by the Crawley family, she meets and secretly marries the dashing Captain Rawdon Crawley. For a time, she enjoys phenomenal success in society, but in spite of her ingratiating ways – or perhaps because of them – there are many who refuse to accept Becky as anything other than a governess. The Sedley’s housekeeper, Mrs. Blenkinsop, is one of them. Lessons by Helen Allingham, (1848-1926). As a result of a mix-up, Elinor arrives at a different house entirely. There she meets Lord Carlyon who makes her a rather shocking proposition. 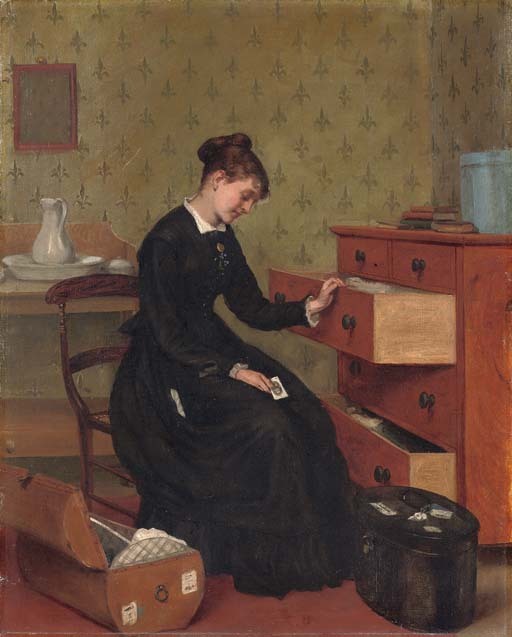 At first, Elinor is disposed to refuse him, but since the alternative is – as Carlyon describes it – a “life of drudgery” in the role of governess, she accepts his offer. 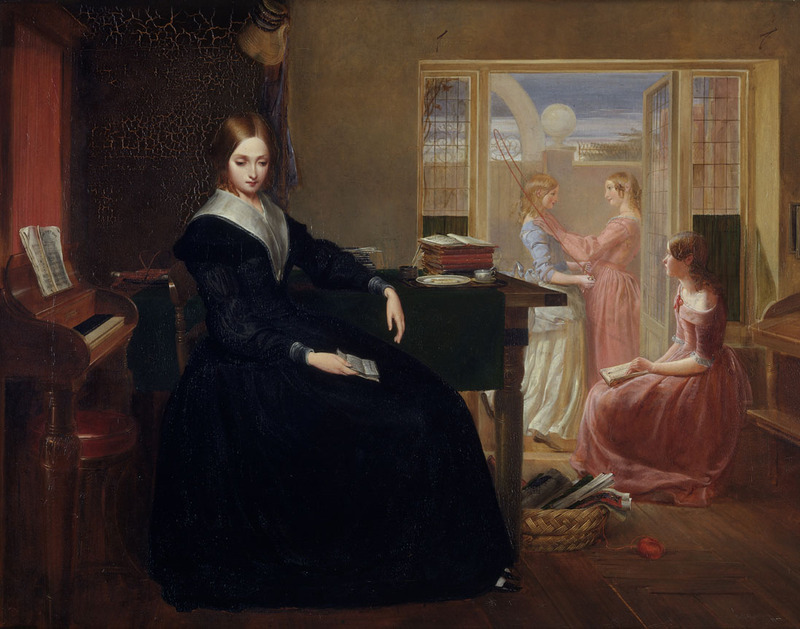 Governesses feature in many more classic works of English literature, including The Turn of the Screw (1897) by Henry James and Agnes Grey (1847) by Anne Brontë. Of course, the real life 19th century governess had none of the limitless possibilities of her literary counterpart. There were no wealthy gentlemen employers waiting to fall in love with her, no dramatic mix-ups resulting in her marrying a dying stranger, and no unexpected inheritances that freed her from her life of service. Instead, she was very much a genteel prisoner of her respectable position. Thank goodness authors of the 19th century were not confined to writing her that way. Austen, Jane. Emma. Ed. George Justice. Norton Critical Editions. 4th ed. New York: Norton, 2011. Brontë, Charlotte. Jane Eyre. Ed. Richard Dunn. Norton Critical Editions. 3rd ed. New York: Norton, 2000. Brontë, Anne. Agnes Gray. New York: Oxford University Press, 2010. Gardiner, Marguerite, Countess of Blessington. “The Governess and The Belle of the Season.” Collection on Ancient and Modern British Authors, Vol. GCLXII. Paris: Baudry’s European Library, 1840. Heyer, Georgette. 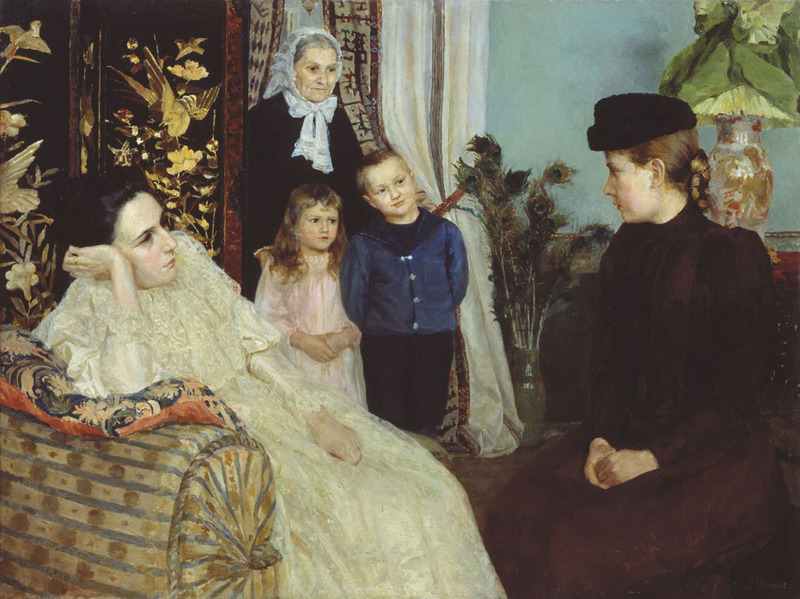 The Reluctant Widow. Chicago: Sourcebooks, 2008. James, Henry. The Turn of the Screw and Other Stories. New York: Oxford University Press, 2008. Ridout, Susan. Letters to a Young Governess on the Principles of Education and Other Subjects Connected with her Duties. London: Edmund Fry, 1840. Thackeray, William Makepeace. Vanity Fair. Ed. Peter Shillingsburg. Norton Critical Editions. 1st ed. New York: Norton, 1994. Thanks for commenting, Sarah! I’m glad you enjoyed my article. It sounds like you know firsthand how versatile a governess can be as a character in a historical romance! You’re right about their real life circumstances being unenviable. I can’t imagine how hard it must have been to exist on the fringes of society – especially if it was a society they had once been a part of. 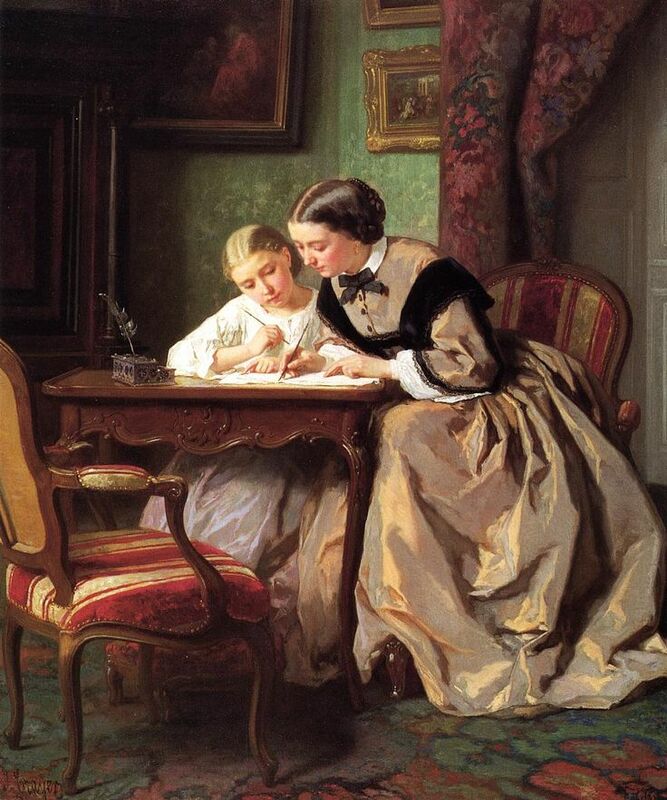 The Heyer book that comes to mind when I think governess is The Nonesuch and Ancilla Trent, more than Elinor Rochdale of The Reluctant Widow – who never is a governess. I read The Nonesuch not long after reading Agnes Grey. My goodness! I have to say Ancilla Trent won my heart! Both women must deal with troublesome charges and both find love but one has a sense of humor and confidence springing from her intelligence and the other is so very, very gloomy. . . . Thanks for the comment, Widget! I’m glad you enjoyed my article. I love the artwork, too. It’s speaks volumes about the real life role of the poor governess. Thank goodness for fiction! Yes, I’ve used them too. A trilogy of heroines at a charity school trained to be governesses. It was lovely to give them their share of romance for a change. As you say, limitless possibilities. Thanks for the comment, Elizabeth! So glad to hear you’ve used governesses in your stories too. They make wonderful characters! Thank you for sharing them, Sarah! Mimi kindly said I might reference my governess books here. They are Prudence, Nell and Kitty, though only Kitty is available on kindle at the moment. Here’s a link: http://www.amazon.com/Kitty-Mills-Historical-Elizabeth-Bailey-ebook/dp/B00OKIKSMS/ref=sr_1_1?s=books&ie=UTF8&qid=1434480056&sr=1-1&keywords=kitty+elizabeth+bailey – Thanks, Mimi! Thank you so much for sharing, Elizabeth! Oh I’ve read Nell, and enjoyed it very much, so did my mother, I thoroughly recommend it! Now I know there are others I shall go looking for Large Print for her! But not usually as unsafe a job as Lord Lucan’s children’s nanny …. What a sad tale that was! The poor nanny. Glad you liked it Monica :) I think, being from a modest background herself, Jane Austen was sympathetic to governesses. And the Bronte sisters, of course, had first hand experience! I love the letters from Jane to her sister Cassandra. Thanks for including an excerpt in your comment. So nice to see her aspiring to better things for her governess friend! I’m glad you liked it Alessandra. Thank you so much for commenting. The options for genteel ladies in reduced circumstances were, indeed, very limited. They could also try to find a place as a ladies companion, but that was no picnic either. Thank goodness women have more options today! I’m glad you enjoyed it, Shandalier! Thanks for the reblog. I think you’re not the only young lady who imagined themselves as a governess in a gothic :) Authors make the profession sound so much more romantic than it really was. Thanks Angelyn :). This is actually one of the top three viewed articles on my site. I had no idea how popular governesses were!